I took some time away. I did a little traveling. Went to Pittsburgh for the first time. Great city. 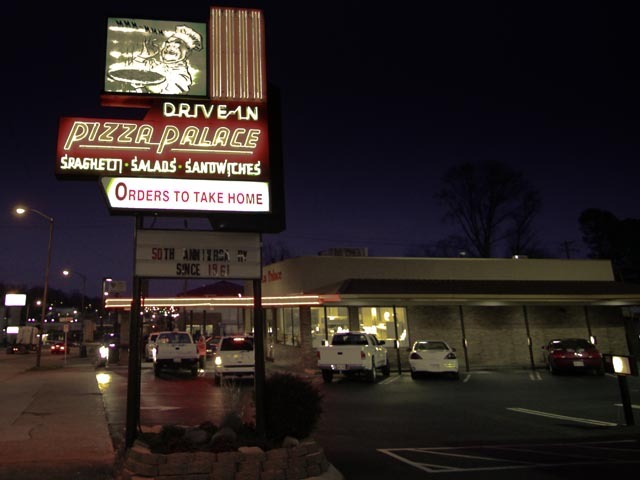 I hit Pizza Palace in Knoxville, Tennessee while I passed through there. Pizza Palace is well-known because it was featured on Diners, Drive-Ins and Dives, one of my favorite shows. I had the lasagna and Greek pizza. I was expecting more ingredients on the pizza, but there was only feta cheese to go along the mozzarella. But it was delicious. The lasagna wasn’t a typical lasagna. It was meat sauce, cheese and noodles thrown together and baked. It was a little salty, but still good. It was a good cheap meal. I’d eat there all the time if I lived there. Over the weekend, Steve Feek of Feek writes, took the time to read my script and gave me some great notes on how to improve my script. I won’t mention them all, but the best one was to change Sam’s occupation to a doctor and have his job somehow be related to his wife’s death. It’s just an excellent fabulous suggestion and alleviates my problem of the audience not sympathizing with Sam. Now, I can have Sam do just about anything and people will still feel sorry for him. Awesome. Thanks so much, Steve. Steve is one of the reasons I decided to post online. Why limit myself to the few people I know that would read it and offer feedback when I have the World Wide Web at my disposal? I think open-source writing could be big. Imagine the next Star Wars movie being a collection of great ideas from all the fanboys? I think it would be brilliant. It would need a head writer, director and producer to go through the crap and find the gems, but the possibilities would be amazing. Get on that Hollywood. I’ve changed the deadline to May 1st for a revised draft. I’m not sure how I should post it online since it will be introduced to existing pages. I’ll figure it out.